We challenge the overuse of pre-trial detention, which undermines the chance of fair trial, the presumption of innocence, and ultimately the rule of law. 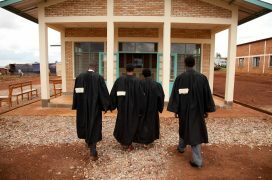 We develop and promote alternatives to pre-trial detention and advocate for access to legal representation and adequate legal aid systems. We advocate for pre-trial detention to be imposed as an exception rather than a rule, in line with international human rights standards. We work with national governments, professional bodies and civil society organisations to raise awareness of the negative impact of the overuse of pre-trial detention, including overcrowding and exacerbation of poor prison conditions. We help promote understanding and implementation of international standards, which protect the rights of people suspected of a criminal offence and which prioritise alternatives to pre-trial detention. We advocate for access to legal representation and adequate legal aid systems, in order to uphold the right of defendants to a fair trial. We contributed to the drafting of UN Principles and Guidelines on Access to Legal Aid in Criminal Justice Systems, and we promote this new instrument and contribute to practical tools being developed in order to support its implementation. We work with governments and parliamentarians to help develop a legal framework of alternatives to pre-trial detention, including an effective bail system. We research and identify the reasons for the lack of or low use of alternatives to pre-trial detention and recommend ways in which the level of pre-trial detention can be reduced without jeopardising public safety. We advocate for drug policies to be in line with the principles of necessity and proportionality, for instance, by ending mandatory pre-trial detention for drug offences. We provide training for police, prosecutors, judges, probation officers and prison authorities to increase awareness of international standards and an understanding of how these can be implemented in practice. We work with public monitoring bodies in a number of countries, providing training and support in their work to monitor conditions of detention for prisoners on remand. We support other civil society organisations and international campaigns that promote access to justice and pre-trial justice, such as the Open Society Justice Initiative’s Global Campaign for Pre-trial Justice.